Speecys Corp. Fuel Cell Powered Robot | OhGizmo! Fuel cells sure seem to be the way of the future, least as far as alternate sources of energy are concerned. They’re getting smaller and more efficient everyday. Japanese company Speecys Corp. has annouced the release of this robot, entirely powered with hydrogen fuel cells. It is 50cm tall, weighs 4.2kg and is operated by a personal computer via a wireless local area network. 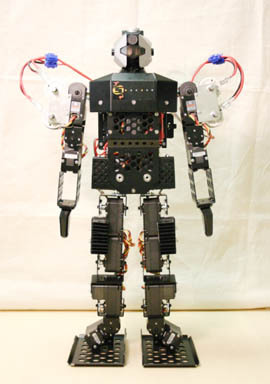 The robot is powered by five fuel cell stacks located in its arms. A 16-liter canister of compressed hydrogen is inserted near the robot’s neck and provides enough fuel for around one hour of operation. Don’t really know what it can do, though. Can it dance? Play soccer? Wash my dishes? I don’t know, the article doesn’t say. It only alludes to such banal things as research, universities, etc. Oh, and it mentions the price: $23,000. Read the article here. Story VIA Mike’s List.